This volume contains the proceedings of the Winter School and Workshop on Frobenius Distributions on Curves, held from February 17–21, 2014 and February 24–28, 2014, at the Centre International de Rencontres Mathématiques, Marseille, France. 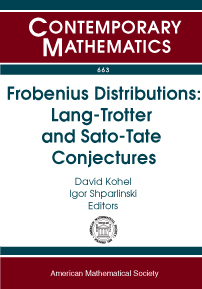 This volume gives a representative sample of current research and developments in the rapidly developing areas of Frobenius distributions. This is mostly driven by two famous conjectures: the Sato-Tate conjecture, which has been recently proved for elliptic curves by L. Clozel, M. Harris and R. Taylor, and the Lang-Trotter conjecture, which is still widely open. Investigations in this area are based on a fine mix of algebraic, analytic and computational techniques, and the papers contained in this volume give a balanced picture of these approaches. Graduate students and research mathematicians interested in computational aspects of number theory and the interplay between number theory and algebraic geometry.